For over 50 years, farmers and locals have resisted the building of a new airport for the French city of Nantes (which by the way already has one). Now in these rich fields, forests and wetlands, which multinational Vinci want to cover in concrete, an experiment in reinventing everyday life in struggle is blossoming. Radicals from around the world, local farmers and villagers, citizen groups, trade unionists and naturalists, refugees and runaways, squatters and climate justice activists and many others, are organising to protect the 4000 acres of land against the airport and its world. Government officials have coined this place “a territory lost to the republic”. Its occupants have named it: la ZAD (Zone À Défendre), zone to defend. In the winter of 2012, thousands of riot police attempted to evict the zone, but they faced a determined and diverse resistance. This culminated in a 40,000 people strong demonstration to rebuild some of what had been destroyed by the French State. Less than a week later, the police was forced to stop what they called “Operation Cesar”. For the last three years, the zad has been an extraordinary laboratory of new ways of living, rooted in collaborations between all those who make up the diversity of this movement. There is even a set of 6 points (see below) to radically rethink how to organise and work the land without an airport, based on the creation of commons, the notion of usage rather than property and the demand that those who fought for the land are those who decide its use. Now, the entire zone is due for evictions to start the construction of this absurd airport. Prime minister Valls has promised a “Rendez-Vous” this October to evict everyone who is living, working, building and farming on the zone. 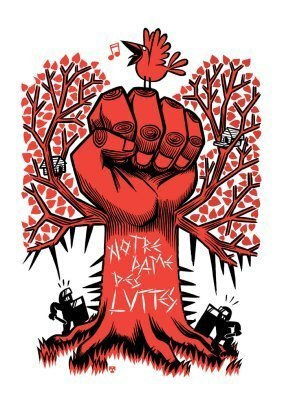 On October 8th, tens of thousands of people will gather on the zad to demonstrate that the determination of the movement is as strong as ever. Honouring farmers struggles from the past, we will come with wooden walking batons and leave them on the zone, as a sign of the commitment to come back and pick them up again if necessary. We will also raise a barn, built by dozens of carpenters during the summer, which will be used as a base, should evictions happen. We are calling on all international groups and movements to either come to the zone on October 8th or show their solidarity with the zad through actions directed at the French government or multinational Vinci in their own towns and cities on that day. The airport will never be built. Life on the zad will keep on flourishing! 1. That the inhabitants, owners or tenants who are part of a compulsory purchase or eviction order can remain on the zone and regain their rights. 2. That the impacted farmers resisting and refusing to bend to the will of AGO-Vinci, can continue to freely cultivate the lands that they use and recover their rights and pursue their work in good conditions. 3. That the new inhabitants who came to the zad to take part in the struggle can remain on the zone. That everything which has been build since 2007 as part of the occupation movement in terms of experiments in alternative agriculture, self-built homes or temporary dwellings (huts, yurts, caravans etc.) and forms of life and resistance, can stay and continue. 4. That the lands that each year are redistributed by the chamber of agriculture for AGO-Vinci’s, in the form of precarious leases, are handled by a body that comes out of the resistance movement and brings together all its elements. So that it is the anti-airport movements rather than the normal institutions that decide on the uses of this land. 5. That these lands are for new agricultural or non agricultural projects, be they authorised or not, and not for the expansion of already existing farms. 6. That these agreements becomes a reality through our collective determination and that we carry together an attention to resolve all eventual conflicts linked to them being put in place. We are already sowing and building a future without an airport in our unity and diversity. It is up to all of us, from today, to enable it to flourish and to defend it.